Marsh, James H.. "Quebec Bridge Disaster". The Canadian Encyclopedia, 25 January 2019, Historica Canada. 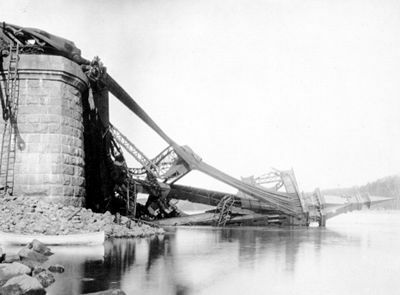 https://www.thecanadianencyclopedia.ca/en/article/quebec-bridge-disaster-feature. Accessed 18 April 2019. 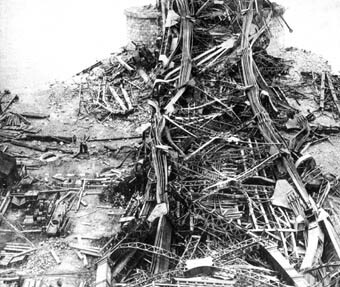 The twisted steel wreckage of the Québec Bridge after its collapse 29 August 1907. Remains after the southern span fell in 1907, killing 75. It took two years to clear the debris from the river. The site became a pilgrimage for engineers come to consider the vast destructive forces of human error. The Canadian government took over the bridge project and rebuilt it with much heavier (and much uglier) cantilever arms. The ill-starred bridge suffered a second disaster on 11 September 1916 when a new centre span being hoisted into position fell into the river, killing 13 men. The bridge was finally completed in 1917 and the Prince of Wales (later Edward VIII) officially opened it 22 August 1919.The Royal Commission of Inquiry investigating the calamity excoriated John Deans for his poor judgment in allowing work to continue when it was obvious that the bridge was in danger. The brunt of the blame, however, was placed on the shoulders of Theodore Cooper, who had committed grave errors in design and his calculation of loads. There was criticism of the bridge company for putting profit above safety and for engineers who neglected their professional and moral duties.